We manage over 30,000 acres of wildlife habitat. These lands are in the Hells Canyon, C.J. Strike and Hagerman areas. On these lands, our biologists provide wildlife food plots, plant trees and shrubs, reduce shoreline erosion and control weeds. This improves habitat and the diversity of wildlife. It also creates striking views. We want people to enjoy our habitat lands. This can mean limiting access to protect wildlife. Idaho Power owns and manages about 22,000 acres of wildlife habitat in Hells Canyon. These lands will total over 24,000 acres when the Federal Energy Regulatory Commission (FERC) issues a new license for the Hells Canyon Complex. The largest properties are Daly Creek, Cottonwood Creek and Sturgill Creek. 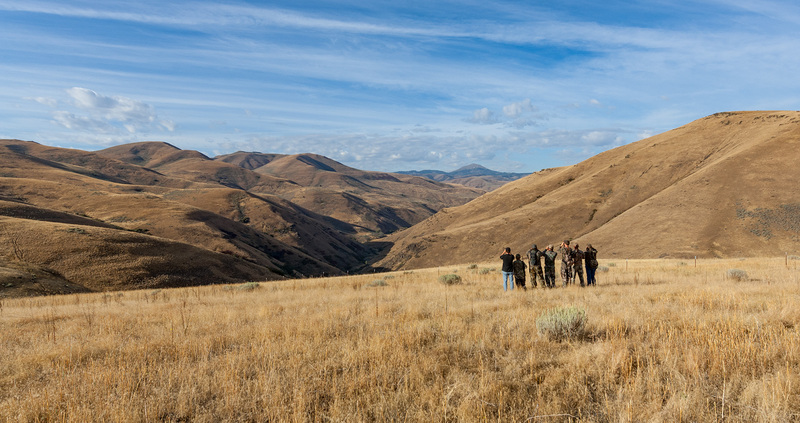 View a map of the Hells Canyon WMA. Daly Creek is Idaho Power’s headquarters for managing our habitat lands in the Hells Canyon area. Cottonwood and Sturgill creeks (on the Idaho side of Brownlee Reservoir) are open to non-motorized use. Access may be limited due to weather or seasonal closures. Camping is not allowed in the Hells Canyon habitat management areas (HMA). The 10,000-acre Daly Creek area is closed to the public, except for the youth hunter program. Other access points around the Powder River Pool at Brownlee Reservoir are open to the public. Use Hewitt or Holcomb parks for camping, restrooms and boat access. A vault toilet is available at the Cherry Creek Sportsman’s Access at Daly Creek. View a map of Daly Creek. Sullivan Road West and Sullivan Road East Sportsman’s Access provide access on the north side of the Powder River Pool. A steep, undeveloped trail leads from the access point to the Powder River Pool. Bank fishing, upland bird and waterfowl hunting and wildlife viewing are available. This area does not have restrooms. This area provides walk-in access to our lands north of Snake River Road, along the Powder River and the Powder River Pool. Bank fishing, waterfowl hunting and wildlife viewing are available. Restrooms are vault toilets. Visitors can also access Bureau of Land Management (BLM) lands south on Daly Creek Road. BLM Sportsman’s Access provides a parking area to access land 1.2 miles to the east. Beyond the parking area, travel by four-wheel drive vehicles or all-terrain vehicles (ATV) is suggested. Upland bird hunting, big-game hunting and antler collecting are allowed on BLM land only. Trespassing is not allowed on private land surrounding the road to the BLM land. Reservoir access is not permitted. This area is open to non-motorized access only. Access the area by vehicle from Mann’s Creek Road and over Bear Saddle or by boat from Brownlee Reservoir. Use Hewitt or Holcomb parks, Moonshine Mine Boat Launch, or Swedes Landing for camping, restrooms and boat access to Brownlee Reservoir. Wildlife viewing and upland bird and big-game hunting are available. Sturgill Creek is day-use only. Fires are prohibited. This area does not have restrooms. Visitors must pack out their trash. View a map of Sturgill Creek. Access to this 1,971-acre area is managed along with the Idaho Department of Fish and Game’s (IDFG) Cecil Andrus Wildlife Management Area (WMA) via the Lake Road Access along Brownlee Creek. To use the lake access gate, call the Andrus WMA at 208-257-3363 or visit their headquarters. The lake access road is subject to seasonal closures. The area can be reached by boat from Brownlee Reservoir. This area does not have restrooms. Visitors must pack out their trash. The Andrus WMA and Cottonwood Creek are day-use only. Use Hewitt or Holcomb parks, Moonshine Mine Boat Launch, Woodhead Park, or Swedes Landing for camping, restrooms and boat access. View a map of Cottonwood Creek. Since 2005, Idaho Power has managed the 3,000 acres we own within the C.J. Strike Wildlife Management Area (WMA). The Idaho Department of Fish and Game (IDFG) helps us manage the area. They perform wildlife management and enforce state fish and game laws. Some areas are closed during waterfowl and upland game bird nesting seasons. The WMA headquarters includes a public restroom and a seasonal recreational vehicle (RV) waste-disposal site. The restroom is open from 8 a.m. to 5 p.m. weekdays, except holidays. View a map of the C.J. Strike WMA. Jacks Creek West Sportsman’s Access and Area are located along Idaho Highway 78. It has gravel parking, picnic benches and a vault toilet. Camping is not allowed in the sportsman’s access. Jacks Creek Area has designated undeveloped camping sites with fire rings, a shallow boat launch and vault toilets along the Bruneau River Pool. View a map of the Jacks Creek area. Idaho Power purchased Turner Ranch in Idaho’s Bruneau Valley in 2007 and manages the area with public interest in mind. Idaho Power and the C.J. Strike Wildlife Management Area (WMA) advisory committee review how the land at Turner Ranch is managed yearly. We clean up the land, control weeds, build and remove fences and care for riverbank habitat. Information and parking are provided at the Turner Ranch Sportsman’s Access site. Overnight camping and fires are not allowed. Restrooms are available only at the WMA headquarters (about 3 miles from Turner Ranch). Be aware of the private property signs bordering the area. View a map of the Turner Ranch area. Idaho Power owns and manages more than 925 acres in the Hagerman Valley for wildlife habitat. These lands are part of the Mid-Snake hydroelectric facilities’ operations and are especially popular with bird watchers. All areas are day-use only. Visitors should follow all federal, state and county rules and regulations, including Idaho Department of Fish and Game hunting and fishing regulations. View a map of the Hagerman WMA. Wildlife viewing, upland and waterfowl bird hunting, fishing and picnicking are available. The area behind the walk-through is foot access only. It can be reached by walking down the road into the canyon. The walk from the parking area to Banbury Springs/Morgan Lake is difficult. Property boundaries are marked with boundary marker signs. A Gooding County ordinance bans use of firearms (other than shotguns) within the Banbury Springs day-use area, including shooting from the canyon rim. The springs are surrounded by poison ivy and poisonous stinging nettle. Stay out of the springs to protect sensitive plants and animals. View a map of the Banbury Springs area. This area offers fishing on the Snake River and limited upland bird hunting. Our access road leads to a boat ramp and primitive campground on the Snake River. Fenced areas are foot access only. They can be reached by walk-overs and walk-through stiles. Overnight camping is allowed only in the graveled area at the boat ramp. View a map of the Bancroft Springs area. Wildlife viewing, upland and waterfowl bird hunting and fishing are available. Visitors can park along the canal road. Areas behind the walk-overs are foot access only. Property boundaries are marked with boundary marker signs. Visitors should follow all federal, state and county rules and regulations. View a map of the Tuana Gulch area.